Last May, NHK organized a big fan poll regarding the Gundam franchise. CCA won the fifth spot in the anime category, Char Aznable won first place in character category, and Amuro Ray second place. Why do you think CCA, Char and Amuro are still so popular? I don’t think I have much to do with it, but if I may say, it must be because of how realistic the characters feel. You can easily empathize with Amuro’s problems. Then you’ve got Char who wears a mask and feels like a typical manga character, but you just feel something different from him. As for the franchise itself, the biggest reason why it’s still popular is because of Japan’s fascination with machines, automobiles, technology… This started after we lost the war, and yet wanted to keep up with America. There were huge leaps in these domains in the 40’s and the 50’s, and it influences our society even now. Speaking of machines, in the Mobile Suit category, the top spot was claimed by Amuro’s Nu Gundam. 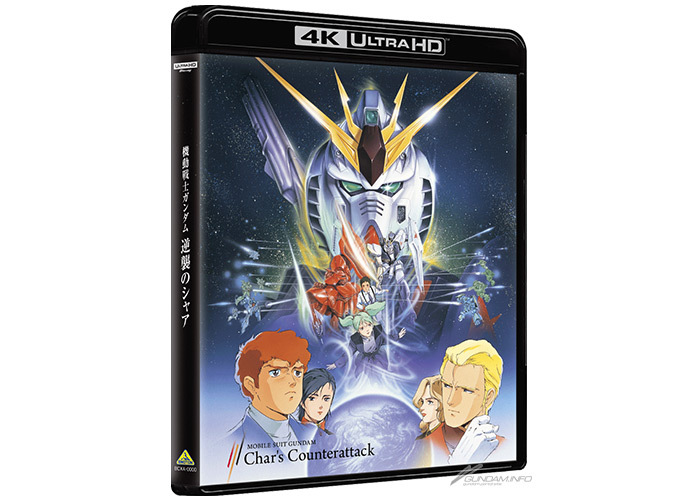 Many interviews were conducted for this 4K release of CCA, including interviews of Mecha Designers Izubuchi Yukata & Hideaki Anno. They both told us you didn’t give them any pointers for the mecha designs. I usually don’t. The very first Gundam, designed by Okawara Kunio, has an extremely « classic » feel to it, If you put it harshly, you could say it looks lame, but if you think about it optimistically, it means it can be improved. So for CCA we wanted to make something cooler, more streamlined. Mister Izubuchi said « For Nu Gundam’s design, the only instruction mister Tomino gave us was how the funnels need to look like a shoulder cape », do you remember that? That was a long time ago so I obviously don’t, but now that you say it, I probably did say something like that. I must’ve put some conditions to prevent them getting carried away. When designing weapons, it’s important to limit yourself. Or else, you make something too convenient and powerful, and thus unusable in the story. What are your thoughts on the 4K ULTRA HD format? I don’t really know the format’s specs. But when I saw the early samples for this release, I didn’t like it much. I get the feeling since when we evolved toward bluray, the only thing that improved is image quality, with sound quality being ignored. Old rereleases like the bluray version ended up making the sound’s quality worse and didn’t do it justice. Though, it depends of each scene. There’s nothing wrong when it’s battle scenes, But for everything else, the sound feels really withdrawn. It’s a shame this wasn’t corrected until now, even though it was a well known problem. The issue lied with the upper management and marketing staff. They wanted rereleases to be as close as the original as possible, refusing to modify anything. But the sound staff knew something was wrong. So when working on this 4K release and I asked them to remake the sound, they agreed right away. For example, imagine if we both stop speaking, and we record the sound in this room. What we’ll get isn’t perfect silence. There will be ambient sounds, like the persons talking in the adjacent rooms. These kind of environment sounds are present in CCA and F91. You can clearly hear them when watching them in theaters. But in 4.1ch, you don’t. During dialogue scenes, the only things you’ll hear are the characters’ lines, and nothing else. This is unnatural, and gives you a sense of unrest. That’s why you recreated these sounds in this 4K release, in order to make viewers experience how it felt watching the movies in theaters back then. That’s it yeah. But to rerecorded this, the original sound data couldn’t be directly used. It was made with analog means, and remasters are made with digital data. So we took the original tape and processed the ambient sounds, and made another track including them you can watch the movies with. So even then, it’s not exactly like the original theater experience, though extremely close to it. Let’s speak about image quality now. Did you voice out your opinion regarding needed adjustments? Not at all. In the end these things aren’t just a matter of color or contrast. In the first place, regardless if it’s better or worse, a remastered release will be different from the original by definition. The device or monitor used to watch comes into play too. But you had to reach a decision right ? I mean, if you believe there’s so many uncontrollable factors to judge image quality, how did you reach the point where you thought the quality was good enough? Usually that’s how it’d go, yes. But I’m inherently completely uninterested in these kind of things. I’d be the first to say my works aren’t good enough for one to ponder for days on how to reproduce it accurately for remasters. So I just left the staff in charge do their job. They’re all pros after all. Plus, it’s a mistake to assume old men like me are always correct *laughs*. Thankfully, my works have been rereleased many times for a while now, so I go a way back with the staff in charge, and trust them. This is slightly unrelated, but how do you watch movies at home? I just watch them. I’m definitely not the kind of person who’s like « I only watch things on the best, biggest screen ». Most other movie directors I know don’t have stuff like home theaters either. We already watch movies either when making them or at theaters, there’s no need to watch them again at home. *laughs*. And I don’t really want to watch them unless it’s for work. This reminds me how long ago, I asked a certain composer: “how do you listen to music at home?, they told me they simply use a CD player and earphones. Because it’s simple and easy, and they don’t want to bother with anything else when they’re tired. Needless to say, I’m not bringing this up to mock music enthusiasts who think high quality devices are important. I actually used to be a music fan like that too, and really wanted to get into that aspect, but in the end I couldn’t. I think it’s the same for all artists. With that said, for this 4K release, using a compatible device is the best. Obviously yeah. But the way you watch it shouldn’t affect the way you appreciate it. I’m a pro, so I think I have the right to put it in cheeky terms: whether you watch it on a small or big screen won’t change whether you think a cut is good or bad. Please just watch the movies the way you like it best. 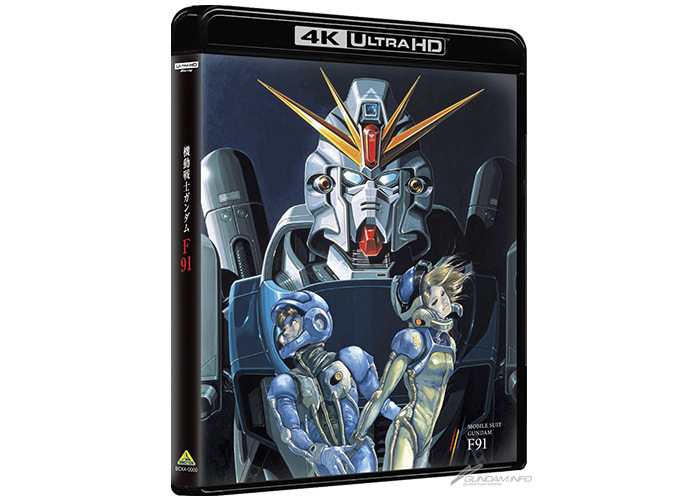 Is there any other work you’d like to make 4k remasters of? There’s none. It may seem like I’m an anime maker at core, but I only make anime because it’s my job. If you take everything I made, there’s maybe only one or two things that I genuinely wanted to make myself. If I’m not commissioned, I don’t have any motivation. I don’t have any drive pushing me. I’m different from Director Miyazaki Hayao, who said “I may have retired, but I’ll come back if I find a good story to tell”. You may think so, but there’s many fans waiting for your new works, including the G-Reco movies. To be honest, I’m not motivated at all. It’s true that I was like “let’s do this! !” after Bandai Namco Arts asked me to do it, so this may seem like a different case than what I just talked about. But it’s not. Well, more or less. What happened is, when G-Reco was about to air on TV, I thought the people in charge of the marketing and business side had an abnormal line of thought. So I started thinking about how I could help them and fix their errors, that’s when I started thinking about doing movies. What do you mean ? What was abnormal ? In simpler terms, I was thinking “Just why are they airing a giant robots series in late night slots”. The marketing people thought that even if it airs in these slots, there’s people who will watch it. I don’t think it’s a good thing, and pushes anime further away from my idea of entertainment. When making anime, I think it’s important to have a cinema viewpoint rather than an anime viewpoint. Entertainment should be about bringing people together, enjoying or hating together some kind of performance. Anime always work better with that way of thinking. In other words, you mean the G-Reco movies will be the real deal. Indeed. Like I explained just before, I had no motivation to work on the TV series. It was just the starter for the main dish movies. So I had to force myself to work on it, and whenever there were parts I thought needed improvement, I’d just think “This airs late night, so no one cares. I’ll improve it in the movies anyway” and leave it as such. It wasn’t a good experience. Do you think this is part of why G-Reco has a reputation of being hard to understand? Not really. That’s because G-Reco has « Gundam » in its title, so a lot of people watch it like they’d watch « Gundam » . I’m not the one who decided to attach the name « Gundam » to G-Reco in the first place, so it really troubles me. But I understand it’s thanks to the fact that it has the name « Gundam » on it that some fans watched it. In the end, as long as out of 100 watchers, there are at least 2-3 people who judge G-Reco as G-Reco instead of Gundam, it’s fine. There’s an upcoming new Gundam series, Kidou Senshi Gundam NT. We’ll also reach the 40th anniversary of the franchise next year. What are your expectations for the future of the series? There’s no way I have any expectations left for the Gundam franchise. How could I, when I don’t work on it anymore *laughs*. But well, both of us could get in trouble if you’d only write that, so I should add something cool. One thing I’m happy about with G-Reco, is how it managed to attract a lot of female fans right away. I think none of the previous Gundam series I’ve done managed to do that. So for its 40th anniversary, I think Gundam really needs to broaden its horizons, and make it so more and more women are interested in it. Children as well. It must be thanks to how G-Reco focuses on many different themes. Indeed. It may be a robot anime, but robots should only be used as gadgets to tell your story. You shouldn’t focus on the robots themselves. Seeing the current direction the world is heading to, the themes we write about in fiction need to adapt as well. That’s what I tried to do with G-Reco. Fiction filled with fantasy or purely made to comfort the audience in their views won’t help us in the future; it’ll get ugly if things stay this way. Nowadays, there are things like ZOZOTOWN or SHOWROOM, you know? As we head towards the second half of the 21st century, children nowadays are living in a world where these things are perceived as natural. It’s not fantasy or healing stories that’ll prepare them for what awaits once they’re adults. I see. Well, I didn’t expect mister Tomino to bring these up. I mean, ZOZOTOWN is a fashion online shop, and SHOWROOM is a streaming service. I only noticed around one month ago, but do you know which crucial trait is shared by the founders of these services? You see, Maezawa Yuusaku, the founder of ZOZOTOWN, and Maeda Yuuji, the founder of SHOWROOM, seem completely different at first glance. They’re making billions of yen with their IT(Information Technology) services, so you’d think they’ve always been big nerds really into computers, right? Truth is, both of them used to be in bands until they were 22,23 years old. And as they were thinking about their futures, and how they’d survive in this world, they reached the conclusions that online shops and streaming are more viable. Do you think bands got anything to do with IT? Well, it actually does. As they kept doing concerts, building up their fanbase, finding new members for their bands etc, they developed their business sense and leadership. In other words, it’s useless to think you’ll immediately become as successful as how the two of them are now. It doesn’t matter if what you do is a band or sports or whatever, but you really need to find your own thing you love, that’ll make you experience things directly, and polish yourself like they did. In other words, you’re saying that everything we learn in life will end up being useful one day? I didn’t talk about learning. It’s useless to learn things. What you need to do is to experience them. It’s not something you can grasp by studying. You need to pile up many experiences within yourself. That’s how anime stories need to be as well, making you experience something. And as for my works, I think that’s what G-Reco is. Anyway, that’s what I noticed when I looked up Maezawa Yuusaku and Maeda Yuuji. By the way, what made you interested in them in the first place? Well, recently there were reports on how they’re respectively in relationships with actresses Gouriki Ayame and Ishihara Satomi, right? I’m not interested in online businessmen, but I am interested in these actresses. I strongly believe in women intuition and think it’s an amazing thing *laughs*. So I got really curious on what kind of people they chose as their lovers. That’s why I checked out their backgrounds and how they managed to build their current careers. That’s when I understood their similar background led them to success. It would be great if young artists and future generations would understand this as well. Anyway. Lesson’s over. It was great right? You better be paying me later *laughs*. Thank you very much for the translation. Your work is always appreciated.